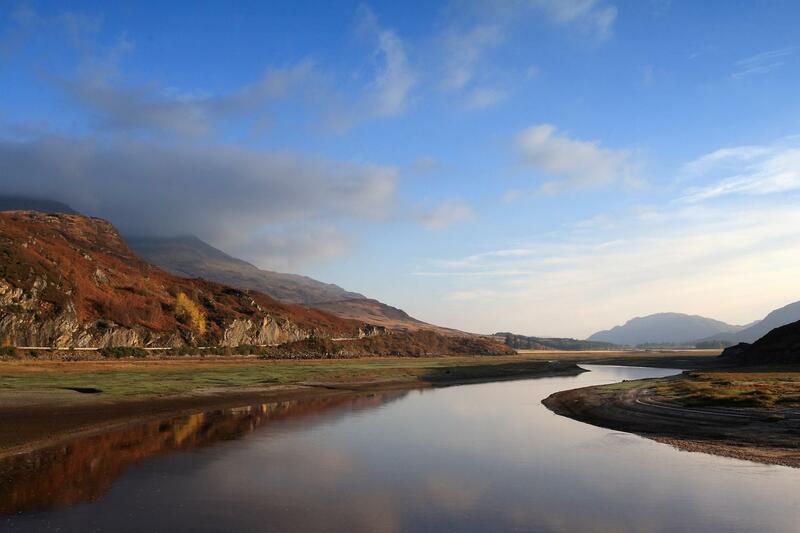 Traverse Scotland's legendary highlands from west to east. 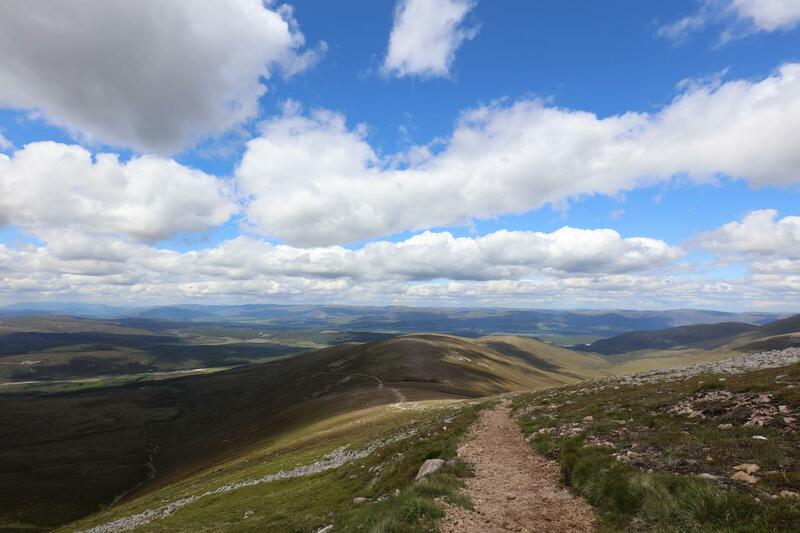 Revel in the 900m descent of Mount Keen - the most easterly Munro. 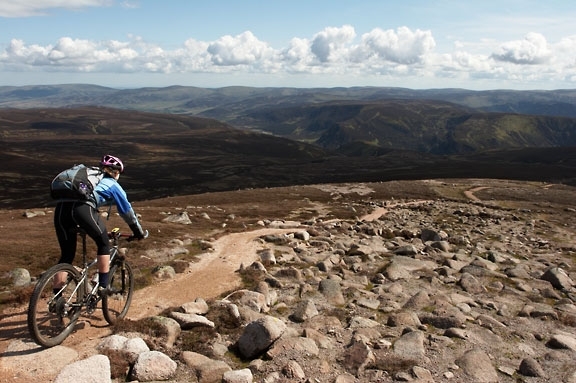 Ride through the wild heather-clad landscape of the Cairngorms on natural single-track. 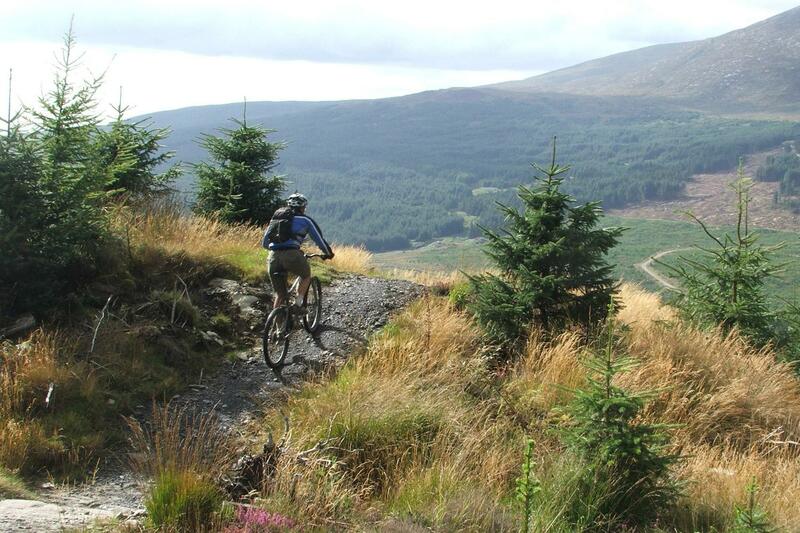 Challenge yourself on the technical man-made trails at Laggan Wolftrax. Enjoy Scotland’s whisky, lively local pub culture. 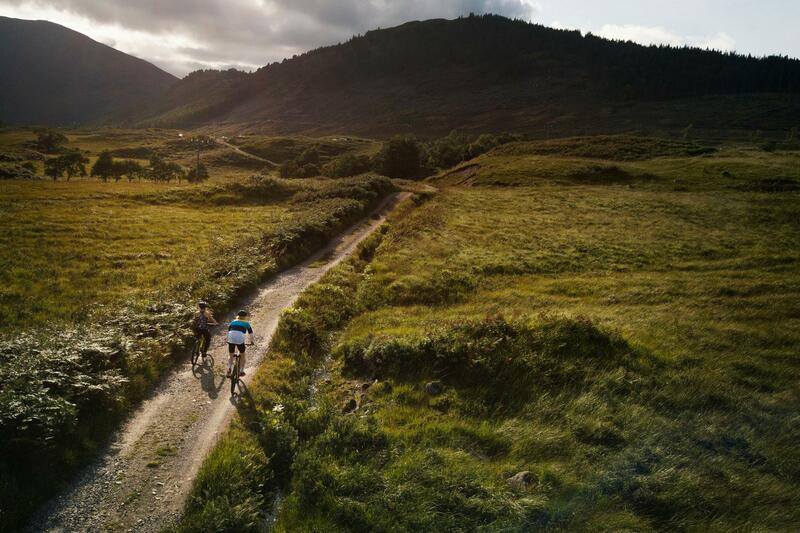 The Scottish Coast to Coast is the iconic mountain bike journey through the highlands of Scotland and quite simply an awesome mountain biking holiday. Our independent self-guided mountain bike holidays on the Scottish Coast to Coast allow you to travel at your own pace, enjoy Scotland’s best mountain biking whilst experiencing our fascinating culture and landscapes. 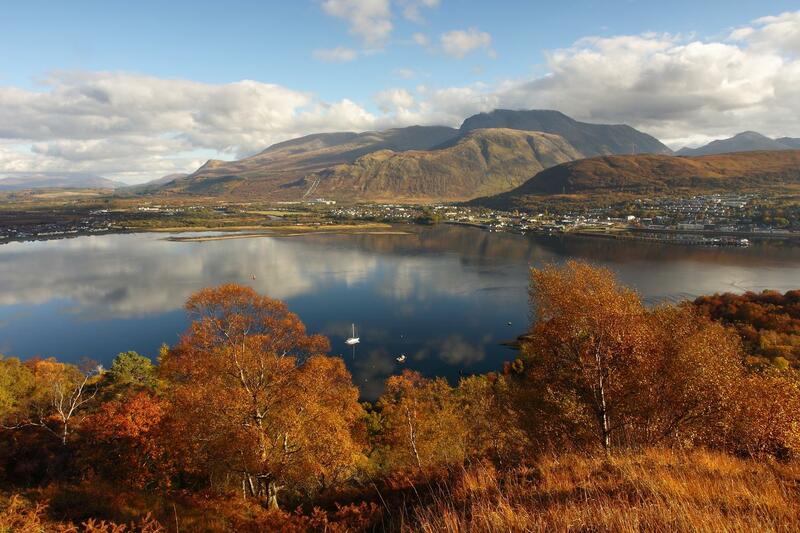 Your adventure starts in Fort William and after 200 miles of excellent riding in the Scottish Highlands finishes in Montrose on the East Coast. Enjoy everything from great man-made trails to smooth natural single-track. Every holiday we offer features hand-picked overnights in B&B’s, country inns, and guesthouses, each is unique and offers a biker friendly welcome, atmosphere and delicious local cuisine. Also included are transfers for you and your bike from Glasgow to the start and back from the finish, daily door to door baggage transfer, comprehensive route notes, detailed maps with the route marked on, downloadable GPX tracks, an information pack and emergency telephone support. We collect you and your bikes in Glasgow at 9am and transfer you to Fort William (~3 hours) where your Scottish Coast to Coast starts with a truly world class day of biking. After a couple of miles of gentle canal side riding throw yourself into glorious singletrack behind the distillery and make our way to The Nevis Range and the man-made delights of “The Witches Trails” this man made forestry centre has miles of challenging singletrack and most riders will spend at least a couple of hours riding these fantastic trails. Alternatively gravity addicts may wish to tackle the awesome Nevis Range Downhill Track which has gondola uplift and red and black graded downhill trails. After a few hours of fun you can enjoy a 15 km spin on forest roads and singletrack to your overnight accommodation in Spean Bridge. The day’s riding starts gently with some delightful tracks along the River Spean and then a short road section from Roy Bridge. The trail quickly changes to a mix of technical natural singletrack and Landrover tracks as you head east into the highlands. The quality of the riding is matched only by the spectacular views over Loch Laggan and The Grey Corries. A sustained climb leads up to the white sandy beaches or Lochan an Hearba and then a fast descent pops you out at the magnificent Ardverikie Castle, set of the TV series Monarch of the Glen. The day finishes at Laggan Wolftrax, one of the Forestry Commission’s best trail centres. Those who want to test themselves further can play for as long as they like on the challenging singletrack, fun park and raised timber sections. An awesome day of riding which has everything the highlands can throw at you. Epic scenery as you climb to the Head of Glen Banchor followed by river crossings, a remote bothy and one of the best sections of singletrack descent we have ridden down into Newtonmore, and that is just the first section. A brief road section follows before reaching Glen Feshie and Rothiemurchus Forests, a challenging mix of forest tracks, secret singletrack, romantic castles and all with the Cairngorms looming ahead of us. 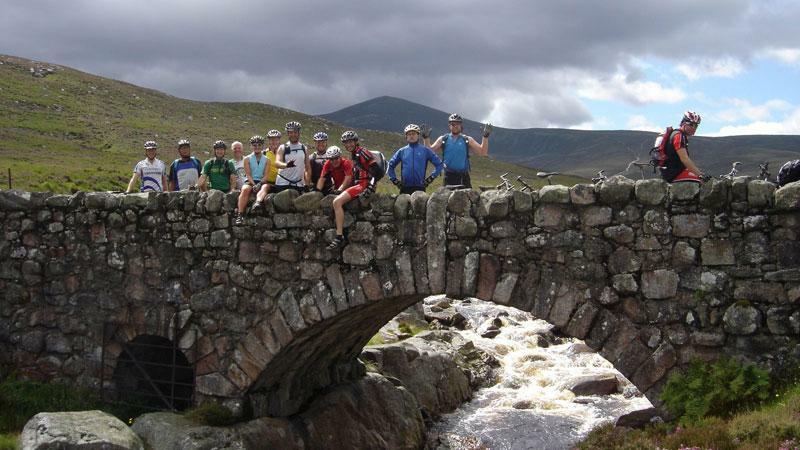 After a truly unforgettable day of riding you'll finish in the bustling outdoors town of Aviemore. Today's ride is almost 100% off road, truly remote and with an awesome mix of epic climbs, technical singletrack and truly breathtaking views. The highlights include the climb from Glenmore past the fairy lake and up over Ryvoan Pass as well as the descent down into Tomintoul. It really is one of the best days you will ever have on your bike. After a few tough days, day five is a slightly more relaxed day riding mainly on Landrover tracks as you skirt the northern edge of the Cairngorms. The good news is that there are some sweet sections of singletrack to keep the mind occupied, awesome views and plenty of river crossings to keep you on your toes. A seemingly endless descent in the latter part of the day brings you to Ballater. There is plenty to keep you occupied for the afternoon, even if it is just catching up on some shut eye. Day six is the highpoint of your week's riding in every sense of the word. 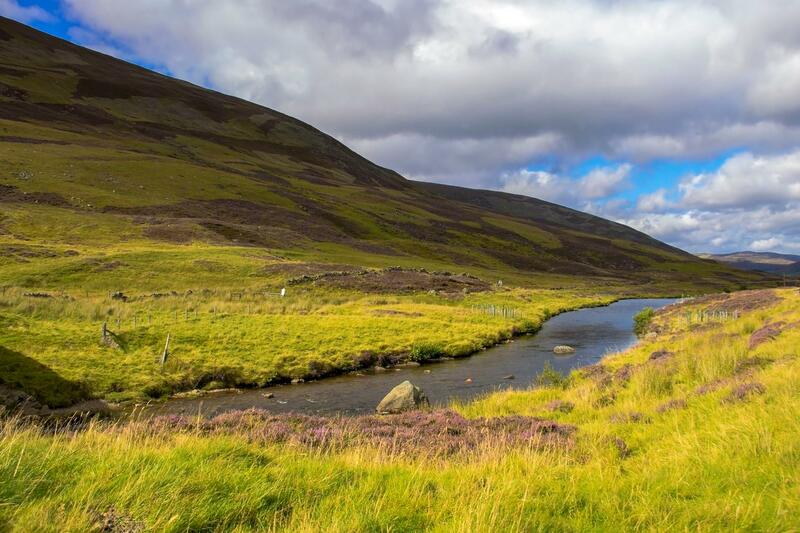 The first few miles of gentle riverside riding don’t seem to hint at what is to come but once you start climbing Glen Tanar and then the Mounth Road you will need every last bit of energy to get you to the top of Mount Keen, Scotland’s most easterly Munro. The descent into Glen Esk is worth every bit of effort! A short section of tarmac brings you to the village of Edzell - your last overnight stop. A short and sweet final ride along quiet country roads brings you to the sea at Montrose and the end of an unforgettable mountain bike journey through the Scottish Highlands. We collect you at approx. 11am transfer you back to Glasgow (for approx. 2pm). You can opt to be dropped off at your accommodation, airport or bus/rail stations. One of the highlights of this tour is the high standard of the accommodation. We specifically choose the hotels, inns, guesthouses and B&B’s to ensure that you enjoy every minute of your stay. 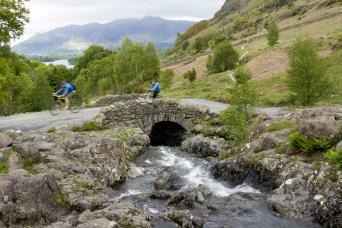 All offer a warm welcome to cyclists, traditional hospitality and delicious local food. The accommodation listed in the itinerary are the providers we use most often. If they do not have availability we may use other accommodation of the same or better standard. This trip is unfortunately not available to solo bikers, but if you require single rooms within your party we will of course accommodate your request. As all our holidays are priced per person based on two sharing there is a single supplement payable to cover the additional costs we incur. 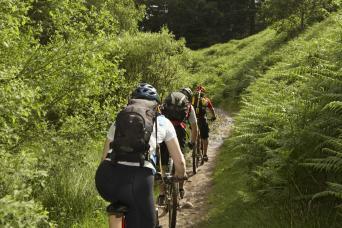 The Scottish Coast to Coast by MTB is available from March to October. You can start your holiday on any date in the season. Option prices will be displayed as part of the booking process. Your bags will be transferred from your accommodation as per your itinerary and moved onto your next overnight accommodation. We ask you to limit your luggage to one bag of up to 20 kg per person. A mountain bike in good condition is essential. Most riders prefer riding an XC type bike although everything from a hardtail to all mountain will be fine. 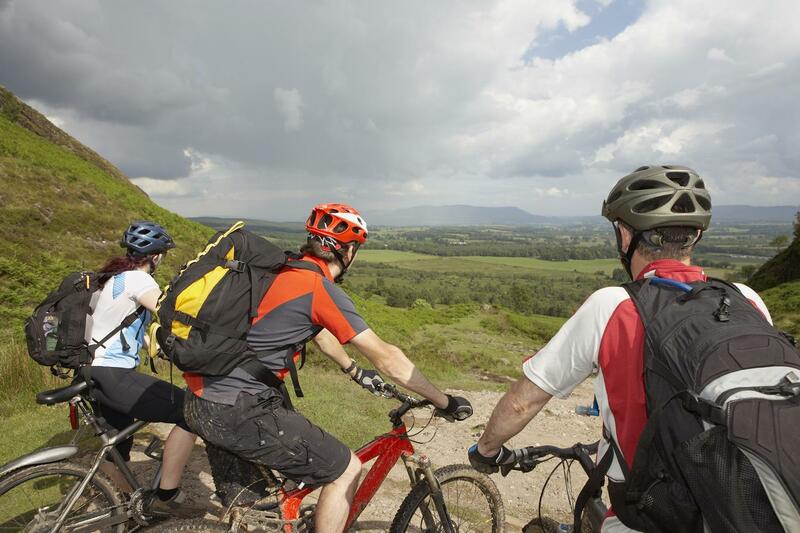 Your information pack has a detailed suggested equipment list which includes standard mountain biking gear such as helmet, cycling clothes, warm and waterproof clothes and a daypack. Most riders prefer to bring their own bikes though bike rental is available should you require. We can store your bike bag/box at our office in Glasgow for the duration of your trip. Alternatively, ask your hotel in Glasgow/Edinburgh if they can store it for you. Most will be happy to. Please request this service in advance. This holiday is graded moderate to challenging and goes through remote and demanding terrain so you should be a regular and fit mountain biker who relishes the thought of a long day in the saddle. You should also be comfortable with dealing with trailside repairs or emergencies as these do happen. The route is not waymarked. We will supply you with a route description, detailed maps with the route marked and downloadable GPX tracks. This is not a substitute for sound navigation skills and at least two of your party should have good navigation skills. This trip can only be booked from west to east due to restrictions with the baggage carriers. Our standard pickup is at 9:00am on day 1 of your trip at Glasgow Airport or your hotel in central Glasgow. We will drop you off at 14:00 on day 7 of your trip at Glasgow Airport, your hotel in Central Glasgow or the train station. We are able to pickup/dropoff at other locations such as Glasgow Prestwick Airport, Edinburgh or Edinburgh Airport for an additional charge. Glasgow is well served by public transport including bus, train and plane. If you are driving to Glasgow the best option is generally to book a stay and park deal at one of the Glasgow Airport Hotels. You can then overnight, leave your car at the secure airport parking and we will collect you from your airport hotel. Dropping you back at the end of your trip. Glasgow to Fort William transfer for you, your bike and luggage. Montrose to Glasgow transfer for you, your bike and luggage. 6 nights in hand-picked accommodations. Daily door to door baggage transfer. A pre-departure information pack for the lead booker. Emergency telephone support from our offices in the event of a problem. The Coast to Coast is a fairly tough trip because you are riding continuously day after day but it is far from an endurance marathon. The itinerary is designed to be enjoyable for a regular rider. If you currently don’t enjoy that level of fitness regular mountain biking supplemented by cardio vascular exercise for at least 6 months prior to your trip is recommended. A good gym or personal trainer will be able to draw up a personalised training programme. We suggest you book as soon as your plans are finalised so that we can secure you the best value-for-money accommodation in each location. Please give us a shout if you have a query. Bikes of a certain price range are usually a good way to tell if your bike is going to last the pace. Anything from around £600 and up would generally do, but front suspension and hydraulic brakes are another good indicator. You will get away with a slightly less expensive bike as long as you have front suspension and it is well maintained. More expensive full suspension XC bikes are also perfect but you should avoid downhill or "all mountain" bikes which tend to be a bit heavy and have too much travel. Your bags will be transferred from your own accommodation as per your itinerary and moved on to your next overnight accommodation. We ask you to limit your luggage to one bag of up to 20kg per person. A fantastic week! My husband is an experienced mountain biker but I am a little more reserved!! I did find parts of the ride a challenge but as a 50 something year old lady I still found it manageable. The whole trip was well organised and the .gpx files we were supplied with were invaluable. Mac adventures really did give an excellent service and 5 out of 6 b&b's were excellent. Distant Hills in Spean Bridge and The Rumblie in Laggan were fabulous establishments with all the home comforts you could wish for. 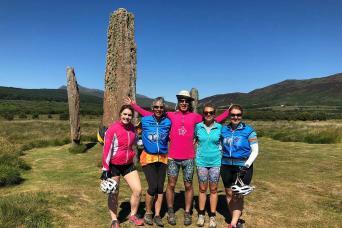 We were blessed with great weather which obviously added to the holiday but the whole experience was amazing, the scenery, the cycling and the support from Mac Adventures. A Surprise Round Every Corner! Four of us came from Toronto to tackle the C2C 6-day self-guided tour. The scenery was stunning. The towns and accomodation were perfect for apres-bike. Our bags were always waiting for us at the next town. The riding was great, but there could have been a bit more singletrack. I would highly recommend this adventure to any group of mountain bikers. You will not be disappointed. A great ride! Just do it!! We had especially bad weather on day one of our ride, and very high winds. We received cautions from Mac regarding river floodings for the following day, which were very much appreciated. We were offered road alternatives, which we ended up staying on--no easy task on Mt. Bikes. We were still in the Highlands on very minor roads with very little traffic. Getting there is painful by train. Make sure you book bike spaces on all legs. Cheaper than flying and the sleeper is ideal.In mid May we got sun rain wind and snow!But no midges. First class accom at Distant Hills Spean Bridge the rest distinctly average with little sign of a bike wash other than the occasional hose pipe and some didnt have undercover storage so take a lock. 6 days was about right, I think we could have done it in 5 easily if the wether held but you take a chance as its not funny in a 60mph wind! The scenerey is nothing short of spectacular with snow tops and often we didnt see anyone person for 6 or 7 hours. Look out for Adders off trail!and herds of mountain Deer. Laggan and Ballater were the nicest places we stayed . The GPS is a must but do take instructions or read up first as its a little confusing to start with. The facility to get your grid reference was invaluable if you find yourself off trail as you can instantly find the position on the map but do practice this if you are not used to navigation as in poor conditions this would be a life saver.Its a long climb up Mt Keen with a bike so keep weight down in the bike and rucksack dept and stay left when the track splits. You then have the option near the top to take the side route as we did as discretion was the better part of valour in the force 9 wind. I wouldnt attempt this on a hardtail or hybrid, full sus is the only way. Having said that there was more road than i expected and less single track. Im sure if you look harder MACS you can find more single track and add optional way points for it? Self-Guided 6-day CTC - AWESOME!! Amazing trip. Great scenery and riding. You get remote, but there is nothing too scary. Great pubs and the accomodations are just fine. Doing this in 6 days puts the pressure on but makes the evenings all the more rewarding. The trip was a once-in-a-lifetime experience, and we enjoyed every second of it, even the ones when we were soaking wet, freezing cold or just plain exhausted. The route was well planned to include beautiful scenery, epic views, great climbs and exhilarating single track. The information pack included lots of helpful information that allowed you to tailor the route, making it harder or easier as you wanted. The GPS unit provided was tricky to get the hang of, but with some basic map reading skills, and some patience, it worked perfectly. Make sure you take a few AA batterys with you, just in case they run out. The accommodations were (for the most part) excellent, comfortable and full of character. Bike and clothes washing were always available when you needed them, and the owners were always happy to make you well priced packed lunches. All in all, it was a fantastic trip, and I just wish that there were more biking trips available so I could try them all. This is a no holds barred, all out adventure as you cross Scotland off-road by bike. The going can be tough, but the rewards more than make up for it and you will experience some of the best single track in the country and have it all to yourselves. Biking heaven!